This is the eleventh post in the Malaysia and Singapore! series. Other posts in this series include Lot 10 Hutong – Kuala Lumpur’s Most Famous Hawker Stalls Under One Roof, LaZat Malaysian Home Cooking, Otak, Otak Fish Dumplings in Banana Leaf, Little Penang Cafe + Visiting the Petronas Twin Towers, Roti Jala – Malaysian Lacy Pancake, and Nonya Malaysian Chicken Curry. Bijan, Onde Onde, and Jalan Alor. Actually, I just love walking. Whenever I visit a new location, my favorite way to experience it is to walk it. I like randomly exploring and stumbling upon interesting shops, roadside food stalls, and people going about their daily lives. Usually when Bryan and I travel, we pretty much eat and walk. Plan out our food stops and walk as much as possible. It’s a lot of work to plan out walking paths, however, especially in an unfamiliar country. You might not know which neighborhoods are safe; the street signs might be in another language; and you may end up wasting a lot of time. Sometimes, especially if Bryan is doing work meetings during the day and I’m traveling alone, I’ll opt to join a walking food tour instead. I’ve realized it’s a great way to be exposed to a new cuisine from the eyes of a local. Plus, it’s fun to learn more about the food and the culture from someone who actually lives there. 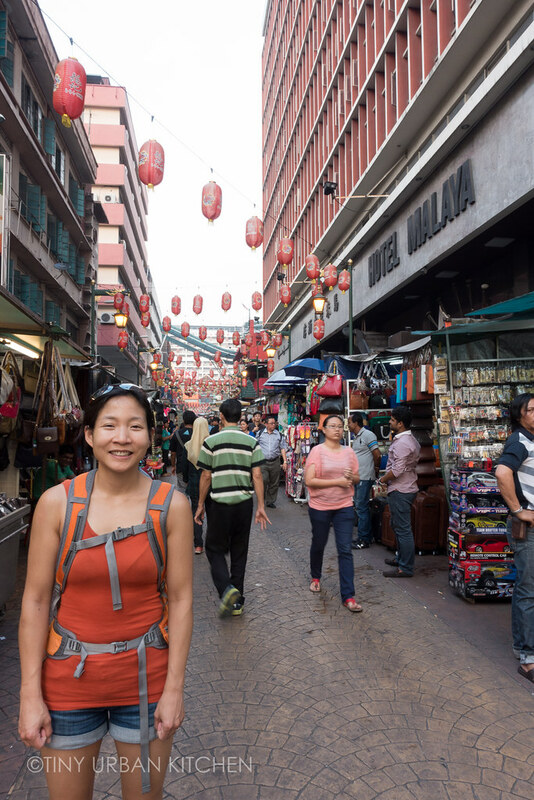 On one of my last days in Kuala Lumpur, I booked a walking tour organized by Food Tour Malaysia in collaboration with Kuala Lumpur Urban Adventures. I had a blast trying all sorts of local treats. Our tour was led by an Indian guy named Charles. He explained to us that his name was Charles because his family is Christian. In Malaysia, I found it really interesting how most people naturally shared their religion. It’s something that comes out naturally, and is a huge part of their identity. In Malaysia, Indians and Chinese practice various faiths, while Malays are Muslim, by law. The streets are colorful and full of life. There are outdoor vegetable markets with so many exotic (at least to me!) vegetables. My first time seeing fresh baby corn! Here’s a woman who’s willing to tell your fortune for a fee. The flower markets are incredible. People put so much labor into these elaborate flower hangings, knowing that they will only last for a couple days.”Are you guys hungry?” asked Charles. I was famished, and couldn’t wait to begin our food tour. 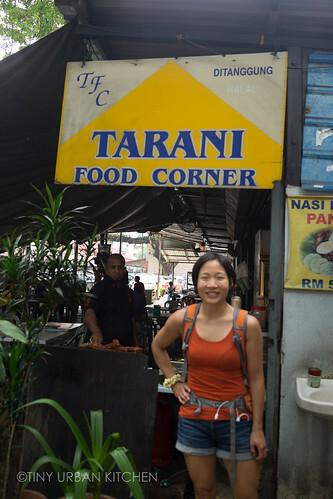 We stopped by an open air eatery called Tarani Food Corner, where we enjoyed a variety of fantastic Indian food. I’m so glad I took a tour for this, because I would have had no idea what to order. Pots of different dipping sauces sat in ceramic bowls heating over smoldering coal. This is battered and deep fried Indian bitter melon, which had a great crunch and a pop of spices that I can’t even begin to name. Suffice it to say that the spices, salt, and crunchiness were the perfect complement for the bitterness of the melon. Roti Canai is ubiquitous in Malaysia. It’s a flat, circular bread made by stretching the dough really thin and grilling it on a flat surface. It taste fantastic when dipped into various sauces. We each received a tray with a square banana leaf topped with rice, a few different dishes, and some pappadum, the thin, crispy cracker-like “chip” you see on the right. I had no idea how to eat with my hands. It was so weird! I was totally caught off guard when I first tried to pick up the food. It’s definitely an art that I have not mastered. I still managed to finish all my food somehow. It was so good, so many interesting and flavorful spices that were new to my palate. I loved it. As we continued walking, our next stop was a simple fry shop that made all sorts of fried foods. They seemed to specialize in various types of doughnuts as well as fried chicken. Pictured above, medhu vadai, a rice and lentil based savory doughnut. I loved the savory doughnuts, especially the masala vadai, the curry lentil patty (pictured on the left), which was my favorite of the bunch. I wish I knew what these were – they remind me of empanadas from South America. Update: these are curry puffs! We continued on our walking tour, next stopping at a little bakery. We sampled one of these dense little fried cakes, called gulab jamun, which are soaked in a fragrant sugar syrup. It was very sweet, frankly a bit too sweet for my tastes. However, I can see how some people might enjoy the intense burst of sweetness. Kueh dadar is a pandan flavored sponge cake with a palm sugar coconut filling inside. I fell in love with the flavor of palm sugar in Malaysia when I discovered it in my cooking class. This is equally delicious and a fantastic snack. Finally, we stopped for chendol, the Malaysian version of shaved ice sold right on the street in a little cart from a Chinese couple in their sixties. Apparently this woman has been doing this for decades. Charles explained that all ice in Malaysia is now pretty safe because the government put in a lot of measures to address the problem. Essentially, all restaurants have to buy ice from specific commercial entities, which cut and handle the ice properly. Gone are the days when people froze their own blocks of ice in their freezers, mixed together with raw meats and other risky items. I loved my shaved ice, which came with a delicious base of coconut milk and palm sugar. I finished my whole bowl even though I was kind of full. Our next stop was Chinatown, where we would enjoy Malaysian Chinese food. Malaysian Chinese food is different from Chinese food. It takes Chinese cooking methods but incorporates a lot of the local produce as well as influences from Malay culture. The result is a vibrant, flavorful cuisine that looks a lot like Chinese food but is exploding in flavors from ingredients like balacan (fermented shrimp paste), pandan leaves, and local herbs and spices. Before heading straight into the heart of Chinatown, Charles first showed us how the various religions in Malaysia live in harmony side by side. On the left is a elaborate Hindu temple, Sri Mahamariamman Temple, the oldest and richest temple in Kuala Lumpur. Not too far away is a Chinese Taoist temple. We then stepped into the heart of Chinatown, a colorful, almost over-the-top area crowded with vendors selling fake knock-off items, food stalls, and lots and lots of people. We entered Restoran Kim Lian Kee, one of the oldest and most historic restaurants in the area. They claim to be the inventor of Malaysia’s hokkien mee, a dish I had actually sampled a few days before at their satellite location inside Lot 10 Hutong food court. Char kway teow is reminiscent of Cantonese chow foon, and consists of stir fried flat rice noodles tossed with bean sprouts, chicken, eggs, chives and thin slices of preserved Chinese sausages. A good char kway teow has that smokey wok “huey” that comes from using a properly super hot wok. I’m not sure what this dish is called (does anyone know? ), but it was these short, worm-like noodles in a hot pot served with a raw egg. We tried their Chasu-bao, or barbecued pork buns, which was similar to what I’ve had in Cantonese restaurants. We also tried a few unusual drinks: A sour lime and plum drink that was interesting, though not a favorite; and “white coffee”, a lighter roast coffee made from coffee beans roasted in palm oil margarine. Roasted pork belly was tender, fatty, and delicious. I really enjoyed this unusual noodle dish, which consisted of thinly fried vermicelli tossed with eggs, chili peppers, and a savory sauce. Alas the tour was over. This small group of people: an attorney from Brisbane (Australia), another couple from Brisbane, a woman from Aukland (New Zealand), Charles from Kuala Lumpur, and me from Boston (United States), had become friends in the last four or so hours. We shared with each other stories from our homelands, cultural differences, and what we thought of Malaysia. It was eye opening and deeply enriching, not only to learn so much about Malaysian food and culture, but also to meet like-minded people who hungered (both figurative and literally!) for travel and learning what other cultures had to offer. I came away inspired, feeling like there was still so much of this world that I had yet to visit, explore, and experience. Those empanada-like stuff are curry puffs! 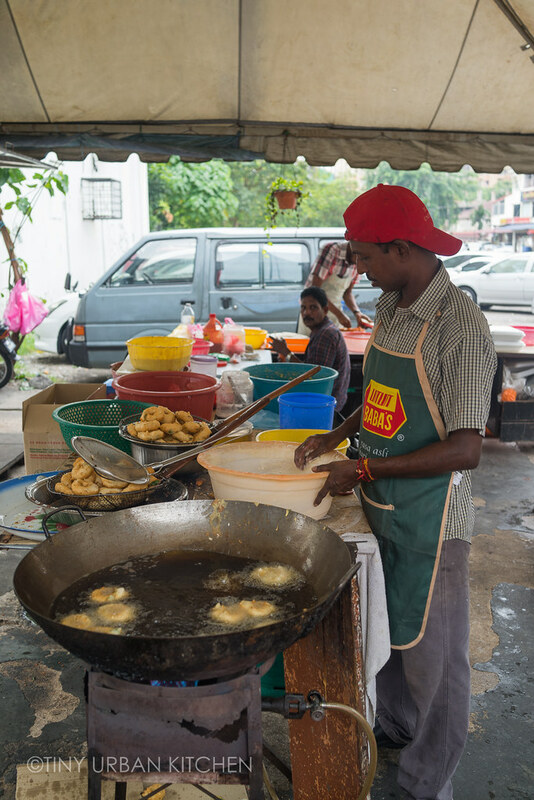 In Malaysia and Singapore, we fry them like empanadas until they turn golden brown, but they are filled with either diced potatoes in spicy curry or sardines in a spicy tomato sauce. There are other variations too, but these 2 should be mainstays. I will hazard a guess that your shaved ice is chendol! It’s usually mixed with these green worm-like noodles, but yours seems to be the wormless version. Glad that you loved it, Malaysia really does have the best chendol in the world hands down. Thanks so much for your tips! I have updated the blog post to incorporate your information. Thanks! I only have one or two Malaysia posts left, and then onto Singapore! I live in Boston now, but originally come from Chennai, India. So it’s nice to see so many familiar foods in your post. I’ve never been to Malaysia, but so many of your pictures look like they could have been taken in my hometown – particularly the flower garlands and the Indian temple. They’re both extremely characteristic of South India. Roti canai too – I recently learnt that it’s pronounced a bit like Chennai, which makes sense. Roti is just the generic term for bread in India, and we eat a bread pretty much exactly like that in Chennai, except we call it parotta (not to be confused with the North India paratha). Incidentally the fried “doughnuts” would both be called vadais (which just means fritter) in South India, specially masala vadai (for the one on the left which you really liked) and medhu vadai (the one on the right). Both are made with rice and lentils, though the masala vadai is usually spicier and has chunkier lentils. Hey Jen, we’re so grateful you came on our tour! We love having like minded foodies and you surely rank on top of our list! HAHA! Hope to have you back one day! Thanks! It was a super fun tour. If I come back I’ll definitely sign up for another tour. Thanks so much for the fantastic photos and the entertaining commentary – it brought back many happy and delicious memories of a great time in KL! Hello, I just went to Malaysia for the first time last week from Los Angeles. The clay pot of noodles is a 老鼠粉, or what they call Lao Si Fen, rats noodles cause the noodles resemble a rats tail. I did not get to try that dish, but my Malaysian Chinese friend highly recommended that to me. I signed up for that tour after reading your blog and paid for it. While in KL I ran out of time and wasn’t able to attend. Coincidentally, I happened arrive in KL early and couldn’t check in, so I walked from my hotel in Sentral to the BrickfieldS below land then I Uber’d it Petaling Street, but I was not able to sample and see as much as you did without a guide. In the end, I think you got a great tour and experience with the tour. I actually went to Brickfields 2x and still did not see as much as you did. Great – glad you at least got to experience some of it!